ARCADIA, Calif. (Feb. 12, 2017)–Idle since breaking his maiden on Dec. 18, Kaleem Shah’s Iliad came back running Sunday at Santa Anita, as he powered to a 3 ½ length win in the Grade II, $200,000 San Vicente Stakes under Flavien Prat. Making his first start for Doug O’Neill, the Kentucky-bred ridgling by Ghostzapper covered seven furlongs in 1:21.62 and thus stamped his ticket to a ride on the road to the $1 million Santa Anita Derby on April 8. Breaking sharply from his outside post position, Iliad was lapped on longshot stablemate Blabimir into the far turn and shook off runner-up Law Abidin Citizen three sixteenths of a mile from home in an impressive display that left heavily favored Battle of Midway some eight lengths behind at the wire. Conditioned by Bob Baffert for his first two starts, Iliad was the second choice in a field of five sophomores and paid $6.00, $4.00 and $2.20. A $285,000 2-year-old in training sale purchase in March of last year, he picked up $120,000 for the win, boosting his earnings to $147,345. He now has two wins from three overall starts. Shah, who was on-hand to watch his Derby hopeful, indicated plans are to stay home for the time being. “I think we’ll stay here and try to run in the San Felipe (Grade II, 1 1/16 miles on March 11) and then hopefully, the Santa Anita Derby (Grade I, 1 1/8 miles on April 8),” he said. Trainer Mark Glatt’s Law Abidin Citizen, who drew the rail with Jamie Theriot, was clearly second best on the day as he finished 4 ½ lengths clear of Battle of Midway. Off at 9-1, Law Abidin Citizen paid $6.00 and $2.40. “I’m really pleased with his race, especially because he just ran two weeks ago,” said Glatt. “I probably wouldn’t have looked at this race if it wasn’t a short field…He (Theriot) had to move a little early down the backside because we were inside. He’s run three really good races since we gelded him (Nov. 26) and I think he’ll stretch out to a mile, no problem. Trained by Jerry Hollendorfer and ridden by Mike Smith, Battle of Midway had no apparent excuses while checking in third, three quarters of a length in front of Aquamarine. Off at 4-5, Battle of Midway paid $2.10 to show. Fractions on the race were 21.89, 44.08 and 1:08.52. Your veterinarian and insurance broker can explain what policies might or might not cover. To limit some of the financial hardship associated with a major medical condition or potential loss. For these reasons and others, equine medical insurance has proven extremely beneficial for some horse owners. From a veterinarian’s perspective, equine insurance has afforded both the owner and the veterinarian the ability to pursue certain medical and surgical procedures. While the veterinarian does not have a vested interest in owners maintaining medical insurance, there are many situations in which the owner could not have afforded life-saving therapies and might have considered euthanasia if the horse had not been insured. Consequently, many veterinarians advocate for securing insurance policies if appropriate for the horse owner. Those in the industry have witnessed considerable changes in equine insurance and the policies available. In the past two to three years, insurance plans have started to mirror many of the human insurance industry’s business models. For instance, major medical policies require the policy owner to assume more financial responsibility than previously. Some of the changes include higher deductibles, co-payments (which vary from a flat fee to a percentage of the total claim), and a cost-sharing split on specifically covered procedures (i.e., 70% covered by insurance, 30% by the policy holder). Additionally, the age at which a horse is no longer insurable has lowered over the years. Most policies limit coverage to horses 15-18 years of age. 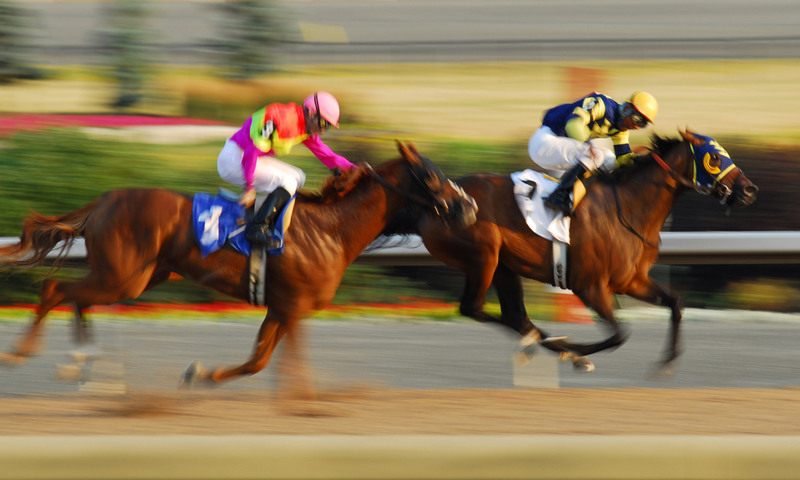 Some companies also don’t insure particular types of horses, such as racehorses. Intentional injury or gross neglect. Over the past five years insurance companies have increased their scrutiny of policy values on major medical and mortality insurance. They base both policies’ financial limits upon the horse’s fair market value, which the company must substantiate. This is determined on a case-by-case basis and often not influenced by independent appraisal values. The value limit is typically based on a purchase price in the first year of ownership or performance (horse show) records, breeding records, and/or professional/training fees paid in future years of coverage. Maintaining an open dialogue with your veterinarian regarding these insurance policies can be helpful. Additionally, horse owners should communicate with their insurance broker when policies seem unclear or confusing. Understanding the scope of coverage is important when making medical decisions with your veterinarian. Due to changes within the insurance industry, horse owners must be more aware than ever of their insurance policies’ limits and what they might be required to pay beyond the policy coverage. Michael N. Fugaro, VMD, Dipl. ACVS owns Mountain Pointe Equine Veterinary Services, an ambulatory practice based in Hackettstown, New Jersey, and is an associate professor of equine studies and the resident veterinarian at Centenary University in Long Valley. Meet Saturday when they finished a head apart in the Grade II Arcadia Stakes at one mile on turf, could return for an encore performance in the Grade I, $400,000 Frank E. Kilroe Mile on Santa Anita Handicap Day, March 11. Both camps reported Sunday that their charges came out of the Arcadia in good order, trainer Carla Gaines speaking of Bolo and trainer Kenny Black of What a View. Bolo, making his first start since last July 17 when he finished ninth in the Eddie Read at Del Mar, appeared beaten when fourth in the field of five at the three-sixteenths marker, but unleashed a furious late rally under Mike Smith to overtake pacesetting What a View who just failed to hold off Bolo. It marked the second straight year Bolo has won the Arcadia, but stay tuned. What a View turned the tables on Bolo when they met again in the 2016 Kilroe. Smith also guided Bob Baffert’s Argentine-bred Vale Dori to victory in yesterday’s Grade II Santa Maria and the trainer stated following the race that she’d be pointed to the Grade I Santa Margarita Stakes at a mile and one eighth on March 18. Competition drives the market and it’s no different when it comes to sponsoring a Santa Anita jockey in their annual charity basketball game against Holy Angels School on Feb. 23. According to Nancy Dollase, co-chairman of the event along with Angie Stevens, West Point Thoroughbreds had already put up the minimum $250 to sponsor Mike Smith in the game, but when Bob Baffert learned of it, ever the sport, he wanted to sponsor Smith, the regular rider of Breeders’ Cup Classic and Pegasus World Cup winner Arrogate, trained by Baffert. West Point and Baffert went round and round, and when the dust settled, Baffert had upped the ante to $750 to get Smith on board. West Point graciously settled on a most worthy alternative, Triple Crown-winning jockey Victor Espinoza. Thanks mainly to the $7 million earned by Arrogate in the Pegasus, Baffert and Smith lead the nation in purse earnings through Feb. 9 with $7,591,928 and $7,769,535, respectively. played at La Salle High School in Pasadena, with proceeds to benefit the Permanently Disabled Jockeys Fund (PDJF), Holy Angels athletic program and the Eye on Jacob Foundation. Given the historic nature of the game, individual jockey sponsors, representing a wide array of racing industry stakeholders, will lend financial support to this worthy cause. Tip off is scheduled for 7:15 p.m., with admission doors opening at 6:15 p.m.
Hall of Fame jockeys Kent Desormeaux, Laffit Pincay, Jr., Mike Smith, Alex Solis and Gary Stevens will all be available at center court for an autograph session at 6:30 p.m.
Tickets are $5 per person, and for every two tickets purchased, individuals receive one free admission ticket to Santa Anita. 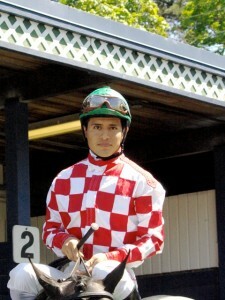 FINISH LINES: Jockey Rafael Bejarano, unseated from Eaglemaker when the three-year-old colt suffered an injury nearing the sixteenth pole in Saturday’s ninth race, took off his scheduled six mounts today. “It’s just precautionary,” said his agent, Tora Yamaguchi. “He’s a little sore but X-rays and a chest scan were negative.” . . .
Versatile Midnight Storm, a Grade I winner on turf and dirt, is scheduled to breeze for Phil D’Amato Monday with his goal the Santa Anita Handicap on March 11 . . .
Trainer John Shirreffs is weighing two races for Jerry and Ann Moss‘s Triple Crown contenders, Gormley and Royal Mo, either the Rebel Stakes at Oaklawn Park March 18 or the San Felipe Stakes at Santa Anita March 11 . . .
Trainer Jerry Hollendorfer has two-time Eclipse champion Songbird galloping two miles a day as she prepares for her four-year-old debut . . .
Mike Smith will be back aboard Megahertz winner Prize Exhibit for trainer Jim Cassidy in next Saturday’s Grade II Buena Vista Stakes at one mile on turf, while Kent Desormeaux has the mount on Mokat for Richard Baltas, who gave the Hall of Fame rider a leg up on the daughter of Uncle Mo for her victory in the Grade II San Clemente Handicap last July 23 . . . Agent Nelson Arroyo reports his brother, Norberto Jr., will resume riding at Santa Anita next Saturday, Feb. 18, after serving a six-day suspension. Norberto took the opportunity to spend time with family in Kentucky . . . Agent Tom Knust has Mario Gutierrez booked to ride California Cup Derby winner Ann Arbor Eddie for owner Reddam Racing and trainer Doug O’Neill in next Saturday’s El Camino Real Derby at Golden Gate Fields . . .
Trainer Peter Miller could have as many as three runners in Dubai on World Cup Day March 25: Palos Verdes winner St. Joe Bay, Stormy Liberal and/or California Cup Sprint winner Richards Boy . . .
Santa Anita offers Dollar Day on Presidents’ Day, Monday, Feb. 20. Enjoy draft beer, soda and hot dogs for just a buck. First post time will be 12:30 p.m. Admission gates open at 10:30 a.m. Santa Anita will be dark for live racing Tuesday, Wednesday and Thursday that week. Live racing will resume Friday, Feb. 24 at 1 p.m. . . .
On Saturday, March 11, when Santa Anita presents the Grade I, $750,000 Santa Anita Handicap, the Late Pick Four will have a guaranteed pool of $1 million, and the Pick Six pool will be guaranteed at $100,000 . . . I understand that the Club is organized as a partnership. I understand that any potential return on my investment is dependent upon how well the Club’s horses perform. Under no circumstances will there be any further charges over and above the initial membership fee, save for the $30 GPEB license fee (see 5. Below). the Club has by way of lease two horses with the intention to race them for the 2017 season at Hastings Racecourse in Vancouver, BC. The horses are Square Dancer and Catch Twenty One. A third horse will be acquired for the 2017 racing season. Richard Yates, Secretary-Treasurer of the HBPA, will represent the Club’s interest as the Club manager of the horses and will be paid a co-ordination/management fee of $500 per month from November 1st 2016 to October 31st 2017.
on October 31, 2017 the Club will cease and be dissolved. The remaining proceeds from member payments and purse money will be returned to the members. Such funds will be distributed on a per share basis. It is intended to create a new Hastings Racing Club for the 2018 Thoroughbred season. The horses that raced for the Hastings Racing Club 2017 will be leased to the Hastings Racing Club 2018 provided it is merited by their performance. Details, including fees for membership in the Hastings Racing Club 2018, will be announced on or before October 31, 2017. 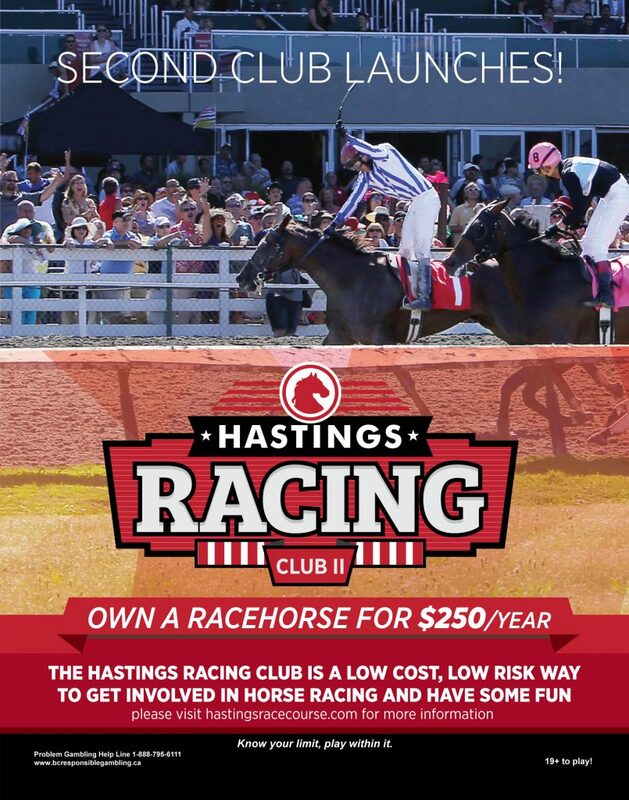 All members of the Hastings Racing Club 2017 will have first rights to purchase a membership in the Hastings Racing Club 2018. I represent to the Club, the BC Gaming Policy and Enforcement Branch (GPEB), and any other regulatory bodies, that I am eligible to receive or have an owner’s license. I understand that a GPEB license is required to own a racehorse, and therefore to participate in the Hastings Racing Club 2017, and I agree to pay the ownership license fee. I understand that if I am denied a GPEB license, I will be denied membership in the Club and my membership fees will be returned. I agree that this is the only agreement or understanding that applies to my interest in the Club. Sandy’s Surprise Wgt-120 Race 5 Sweet Life S.